No computer system will function without a healthy and functional hard drive. This line alone states the importance of the hard disk. If you have a hard drive and it becomes corrupt, you are in big trouble. What one can do in such a situation is to recover permanently deleted data from hard drive. For this purpose, many applications are available. But not every tool is as efficient as SysTools Hard Drive Data Recovery software. In this post, we will share a review of this product with our readers. First of all, we will learn the basic information about the hard disk recovery software. Processor Intel® Pentium 1 GHz Processor (x86, x64) or its equivalent. Hard Drive Data Recovery software is an efficient utility that offers complete data recovery facility to the users. Whether you have soft-deleted files or and permanently deleted, those can be restored seamlessly with the help of this program. Both GPT and MBR style partition is supported by this data recovery tool. The software can process hard drives with FAT, exFAT, or NTFS file system. Users can utilize this application for internal as well as external drives. This application is available in two different versions: Demo and License. The demo version of this tool can be downloaded from the company website for free. However, this version does not allow you to save the recovered data. To do that, you need to purchase the license version of this program. The license version offers all features of the tool and got no limitations. So, it is the best tool to recover permanently deleted data from hard drive. Here are some of the mention-worthy features of Hard Drive Data Recovery Tool. We all know that deleted data can be of two categories: soft deleted and hard-deleted. 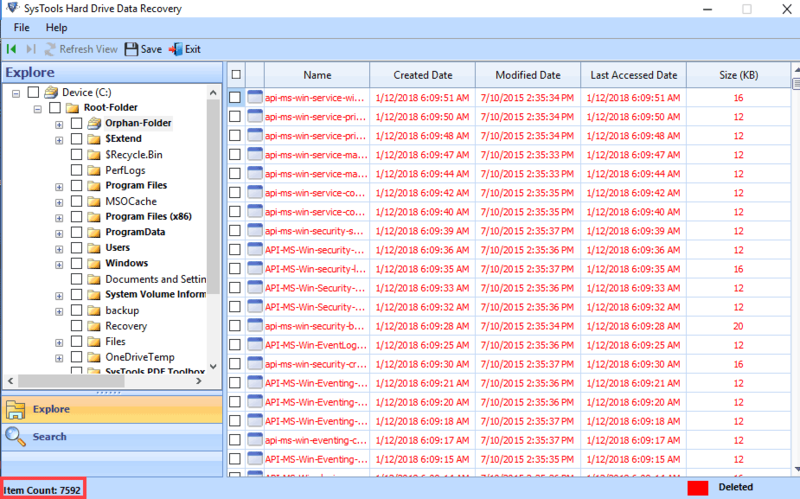 Manual recovery of hard deleted data is impossible, but it is a simple matter for this tool. This tool not only restores all deleted files but also displays the deleted files in red color. So, using this software to recover permanently deleted files from hard drive is the quite wise decision. You may need to recover deleted data from external or internal hard drives. This one application can fulfill all your needs. It also supports data recovery from USB pen drives of all prominent companies. It becomes easy to recover permanently deleted data from the external hard drive. All file types are supported by this software for restoration. It means that whether it is an image, audio, video, document or system file, you will be able to get it back. Various deleted RAW data can also be restored by this tool. So, don’t worry about lost file types. The tool will retrieve permanently deleted files from hard disk easily. If you have a large number of files in your drive, it might be difficult to track a single file or files of a particular file extension. In this case, the search feature of this program will come in handy. Using this, you can locate all files of a particular date range and file extension. If you have to recover deleted data from a formatted drive, this software is the right tool for you. If you have not overwritten your formatted hard disk, the software will get back your data. It also supports data recovery from Solid State Drives (SSDs). Folder hierarchy of HDD files is a crucial thing and its alteration can cause inconvenience to the user. To avoid this issue, the tool strictly retains the original folder hierarchy of hard drive. Due to this feature user can easily find the required file after successful recovery of permanently deleted files. This tool has a simple interface that users can operate easily. Here is how you can run it. 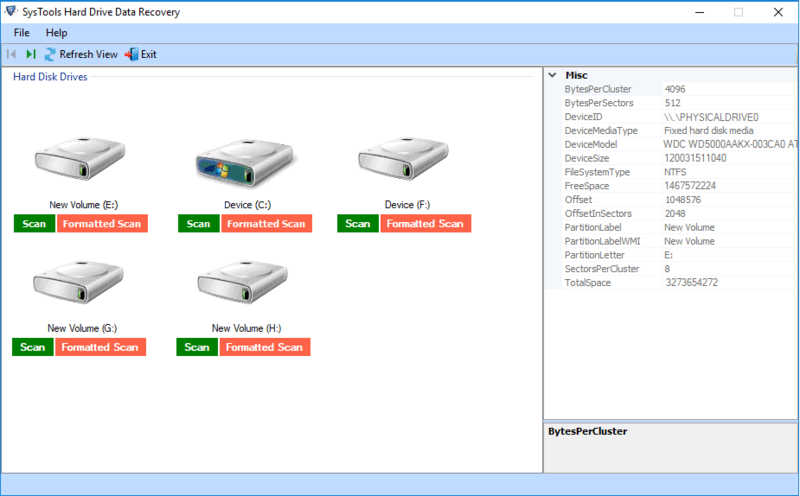 Launch SysTools Hard Drive Data Recovery Tool. 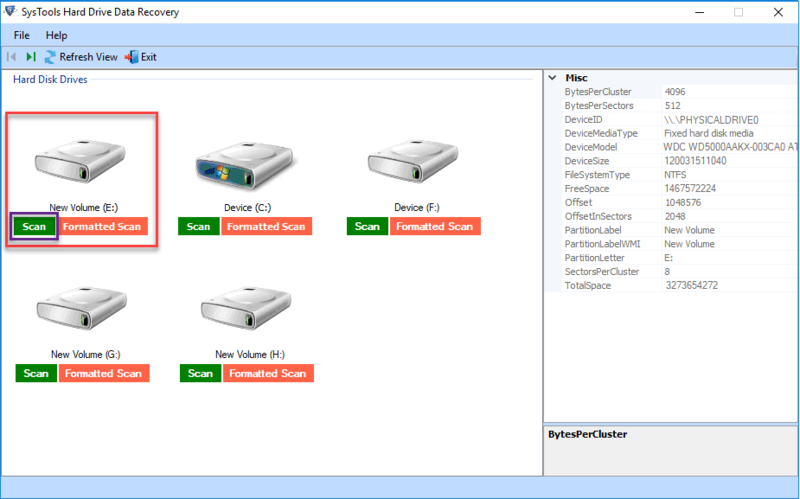 There are two options for drive scanning drives: Scan and Formatted Scan. 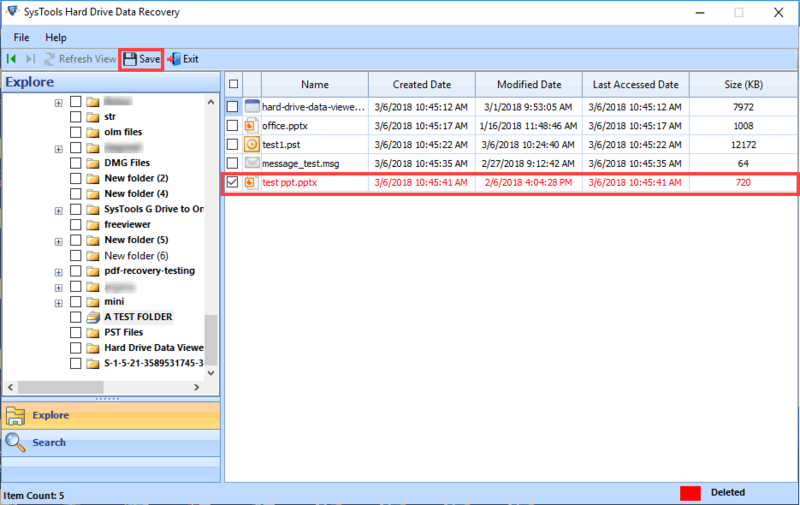 Select Scan to recover deleted files. If the drive got formatted, choose Formatted Scan. The tool will scan and display all of its items, including the deleted ones in red color. Choose the files you want to retrieve. Select destination location and Save recover the data. According to my observation, this software is fully capable of recovering both soft-deleted and permanently-deleted files. Users can depend on this tool as this is completely reliable and easy to use. It recovers permanently deleted data from hard drive without any hassle. I am happy to rate this tool 9.7 out of 10.